Anghiari, placed between Sansepolcro and Monterchi, is an enchanting ancient town built on a promontory overlooking the Valtiberina. It is part of the ‘club’ of Italy’s Most Beautiful Villages, a title conferred to those which have best preserved their historical heritage. Once the property of the Camaldoli and later of the Tarlati family, it was the site of a victory in 1440 of the Florentines over the Milanese, a decisive victory in thwarting Visconti ambitions over not only Tuscany but also the rest of Italy. Leonardo da Vinci chose it as the subject-matter for a fresco in the Palazzo Vecchio, in Florence, unfortunately lost short after it was painted. 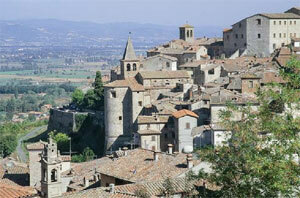 Anghiari is considered one of the "most beautiful villages in Italy" by the Italian Touring Club. Just over 1 km to the south-west, is the attractive Romanesque church Pieve di Sovara, and on the Sansepolcro road you can still make out the 8th century Byzantine origins of Santo Stefano. Sansepolcro shining at the foot of the Apennines, on the border with Umbria and Marche Legend has it that Sansepolcro origins can be dated to the two holy pilgrims, Arcano and Egidio, returning from the Holy Land who decided to stay here and build a small chapel to house the sacred relics that brought from Jerusalem. Between 1300 and 1500, lived an period of maximun splendor Sansepolcro, famous as the birthplace of Piero della Francesca. Originally it was a Roman settlement: the streets are set up like in a castrum, parallel in the upper part and perpendicular in the lower. The Museo Civico houses the wonderful fresco by Piero della Francesca (1420-1492 AD). La Resurrezione, plus the Polyptych della Misericordia In the Civic Museum is also a wonderful painting by Luca Signorelli, Santidi Tito , Jacopo Pontorno et..
You can also visit the Romanesque Cathedral that was altered during the XVI century. Inside is a carved Christ on the cross dating from the X century, known as the Volto Santo, and also an important Crucifixion by Bartolomeo della Gatta. Other churches of interest include San Francesco, Santa Maria dei Servi, Santa Maria delle Grazie, San Rocco, San Lorenzo with a striking painting by Rosso Fiorentino, and Sant’Antonio that has a processional banner by Luca Signorelli. The imposing city walls were built by Tarlati and restored during the Renaissance by Giuliano da Sangallo. The fortress at one corner is now a private residence. By 1441 AD it was greeted into the territory governed by the Florentine Republic, where it remained until it was overtaken by the powerful Lorena dukedom, whose dynasty was ended by the Napoleon's conquest. The Treaty of Vienna restored Sansepolcro to the Grand Duchy of Tuscany. Today the valley lives of tourism, wood processing, Goldsmith and earthenware. A great importance is the economic activity of the big food industry that find their home in Sansepolcro. The town centre is built on a hill about 356 metres above sea level and resembles an island in the centre of the valley. One of the most delightful details of the town is the archway that sourrunds which circles much of the town at the base of the fortified city wall—part of which is known as the Via degli Innamorati, or Sweethearts’ Way. taurant, and—oddly—tiny silversmith. 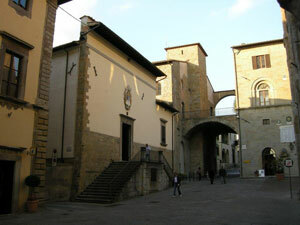 The origins of Arezzo are lost in the very ancient past. As the settlement grew, eventually became an important Etruscan city, and was later part of Rome. From the 4th century had become a Bishopric. Occupied by the Lombards at the end of the 6th century in the Middle Ages, Arezzo was a free commune. The city was often at war, with Siena, but above all with Florence and, in 1384, it was finally subjugated to Florentine rule. The city was often at war with Siena certainly, but especially with Florence and, in 1384, was finally subjected to the dominion of Florence. 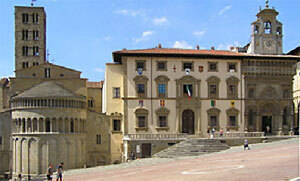 From then on, the story of Arezzo moves with the history of Florence and, later, for the fate of Tuscany. 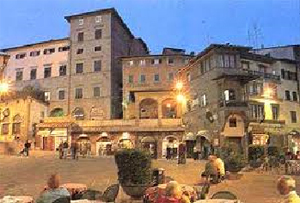 Arezzo is “city of gold”. Arezzo, city of the jousting tournament Giostra del Saracino, of the Antiques Fair and of the international polyphonic competition “Guido d’Arezzo”. Arezzo, a gem set amidst the gentle Tuscan hills, birthplace of so many illustrious personages that the distinguished poet Giosuè Carducci exclaimed that the territory of Arezzo alone is “sufficient to give glory to Italy!”. This splendid town stretches out on the slopes of the Monte Subasio, in the valley river Topino and Chiascio . The origin of Assisi is Roman , but construction of the buildings , is surely due to the city's development during the Middle Ages. Assisi's oldest nucleus, which is protected by a wall made up of eight fortified entrance portals and a long belt of town walls, which are still perfectly preserved, is topped by two castles on peak of the Subasio: the Major Castle, and the Minor Castle. 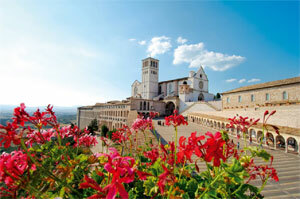 At Assisi shines the Basilica of St. Francis, the tourist can also visit the Basilica of St. Clare and the Church of St. Peter. The first in the Gothic style between 1257 and 1265, the second is a little older . The Cathedral, vaunts a splendid and unaltered facade with sculptures and reliefs. On the Town Square situated on the old Forum, the Priors' Palace ( the Palace of the People's Captain and the Temple of Minerva, built during the augustean period with pronaos, columns and Corinthian capitals which are yet intact. Nearby, Eremitage of the Prisons, surrounded a thick wood of oaks and ilex, the convent of St. Damian. Finally, in the plain, the massive Basilica of Saint Mary of the Angels was built to protect the Porziuncola Chapel, which was the first meeting-place of the Francescan brotherhood. What, is Saint Francis' Way? Conceived as an itinerary linking together a series of sites associated with the life and teachings of Assisi's saint, this "new" pilgrim route reintroduces the Franciscan experience in the context of the very land Francis walked in his travels. Indeed, it is from this intimate bond with Francis' life story that the Way derives its credibility and appeal: passing through landscapes where pilgrims can view the same natural beauty which so moved Francis' simple heart; stopping at sites which conserve the memory of his words and example; meeting the people along the route so closely tied to his spirit. 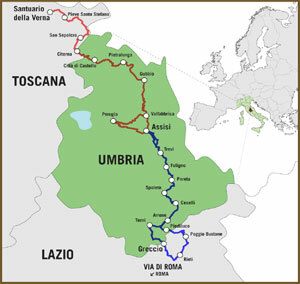 Despite the distance of centuries, Umbria and Valtiberina has remained Francis' land, a land sustained by a spirituality based on loving that which is simple, respecting and appreciating all of creation, and accepting our fellow man, whomever he may be.